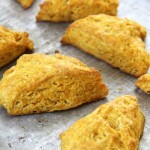 These Pumpkin Biscuits are the perfect addition to your fall soups and stews. They’re delicious served up warm from the oven with loads of butter! Whisk together flour, sugar, baking powder, salt and baking soda. Using a pastry cutter, cut in the chilled butter, until it looks like coarse meal, with some pea sized butter pieces remaining. In a separate bowl, combine the pumpkin puree and buttermilk. Then add the pumpkin/buttermilk mixture to the flour. Stir with a fork, but don’t over mix. Then turn the dough out onto a floured surface, and knead into a ball. It is supposed to be lumpy – that’s what makes them so buttery and crumbly! Then flatten the ball into a circle disc shape, about 1 inch thick. The disc should be big enough to get 8 biscuits cut out of it. Using a pizza cutter, cut the disc into 8 pieces.